I recently got back in to painting. I've taken what I was doing 14 years ago and gone to the next level. If any of you guys need work done please don't hesitate to ask. I've finished over 100 patches so far and put them in an online catalog of sorts. By the end of the month it will be close to 150 WWII designs. Thanks! Let me endorse Jim...great quality work. I ordered patches from him and they adorn my A2 as well as my son's. We get great feedback from everyone who sees them! The last few months have been busy. The website has grown to be over 100 pages. Taking cues from Scott I've started a new project to document the USAAF. Google earth is a powerful tool for finding the past. It's one thing to look at old photos...it is another thing to be able to relate these photos with where it actually happened. Many of the bases are still there, or at least partially recognizable, even the farmland of southern Italy. This is a long term project that I hope to add 1-5 groups per week depending on time. This will be tied together with a brief group history and their insignia. Links will be provided to relevant websites and a .kmz file can be downloaded to explore in Google Earth. Feedback and suggestions are always welcomed! Unique Witchcraft patch, as seen in the recent book about WC and the 467th. Here are a few more for posterity. Mike Porter recently commissioned me to bring his cartoon Stearman to life. This is based on his personal Stearman that was stationed at Avenger Field during WWII. We are still looking for ideas for a nickname...some have suggested "pete the PT", "Porter", and a few others. Suggestions welcomed! I recently found a local seamstress that is willing sew the patches that were prevalent in the CBI...the 23rd Fighter Group was the first to be tackled...more are on the way. The 1st FG from Brazil fought in Italy with the 15th AF...this insignia is still in use today. 490th Bomb Squadron 341st Bomb Group...accurately reproduced and hand sewn. Adding more group histories, leading off with the 91st Bomb Group, several more in the works over the next week or so including the 475th FG, 454th BG, 455th BG, 464th BG and 465th Bomb Groups. Latest projects...I'm now making full scale P-51B/C and D fuselage side panels. Several are in process and I will be posting them as they are completed. 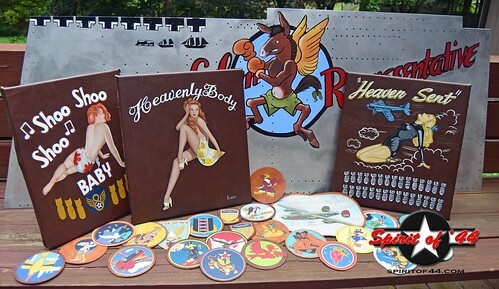 I am also offering recreations of WWII A-2 jacket art on goat skin mounted over traditional canvas stretchers. They come frame ready and I can do custom designs as well. More soon! contact me direct at jfhar43@gmail.com for specifics. Thanks!